On the occasion of the One Great Step world tour’s stop in France, French Invasion and Infinite-France are teaming up to organize projects for the concert. To make those projects come true we are raising donations because without your support and participation nothing can be done ! We will now reveal the different points of those projects. We hope that you will appreciate it and that you will participate ! The orders for Goodies pack are closed. ★ TO GET HIS PACKS ? Thank you to bring an ID or any document proving your identity! /!\ Attention : that this pick-up can possibly be cancelled or the meeting time modified because of the arrival of INFINITE in Paris. You will be kept informed in this case. You can ask one of your friends or relatives to get your pack but it will require to send us an email at frenchinspiritunion@gmail.com with his name and surname as well as yours and the number of ordered pack. Thank you to bring an ID or any document proving your identity, we spend in the queue to give you your pack and verify your identity! /!\ Attention : no pack will be delivered by hand after 5:00 pm for security reasons from Olympia and organization for us! At the end of the concert we will chant « Dashi dorawa, dorawa dorawa » so that they come back for a last song. 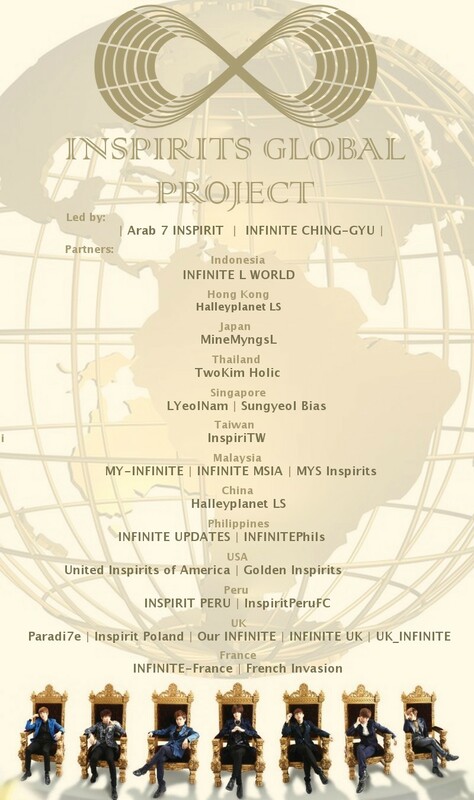 French Invasion and Infinite France have joined the list of international fanbases taking part of the global project . What is this project ? This huge project aimed to thank the group for their first world tour in a video that will include thanks from fans in all the world. Both organizers fanbases CHING-GYU and Arab7inspirit will make the final video who’s planed to be broadcast during the last concert of the tour in Dubai. Nothing because the project is about filming the fans while waiting OUTSIDE the venue of the concert to thank INFINITE and showing them our support. Infinite France and French Invasion are responsible in representing the French INSPIRIT, so we will come to you and will take care to shooting the video while waiting for the concert in FRANCE. French Inspirit union : French Invasion and Infinite-France .